The human body consists of a variety of cell types with distinct characters. An essential information code that defines a cell’s unique character is the epigenome, which refers to the whole-genome assembly of epigenetic modifications of chromatin. We are studying the mechanism of germ cell development, which, among all the cell types in the body, shows one of the most dynamic regulations of the epigenome to acquire totipotency, thereby aiming to understand the regulatory basis for many distinct cellular characters and to control them appropriately in vitro. The germ cell lineage ensures the creation of new individuals, perpetuating/diversifying the genetic and epigenetic information across the generations. We have been investigating the mechanism for germ cell development, and have shown that mouse embryonic stem cells (mESCs)/induced pluripotent stem cells (miPSCs) are induced into primordial germ cell-like cells (mPGCLCs) with a robust capacity both for spermatogenesis and oogenesis, and for contributing to healthy offspring. We have also shown that human induced pluripotent stem cells (hiPSCs) robustly generate human primordial germ cell-like cells (hPGCLCs). 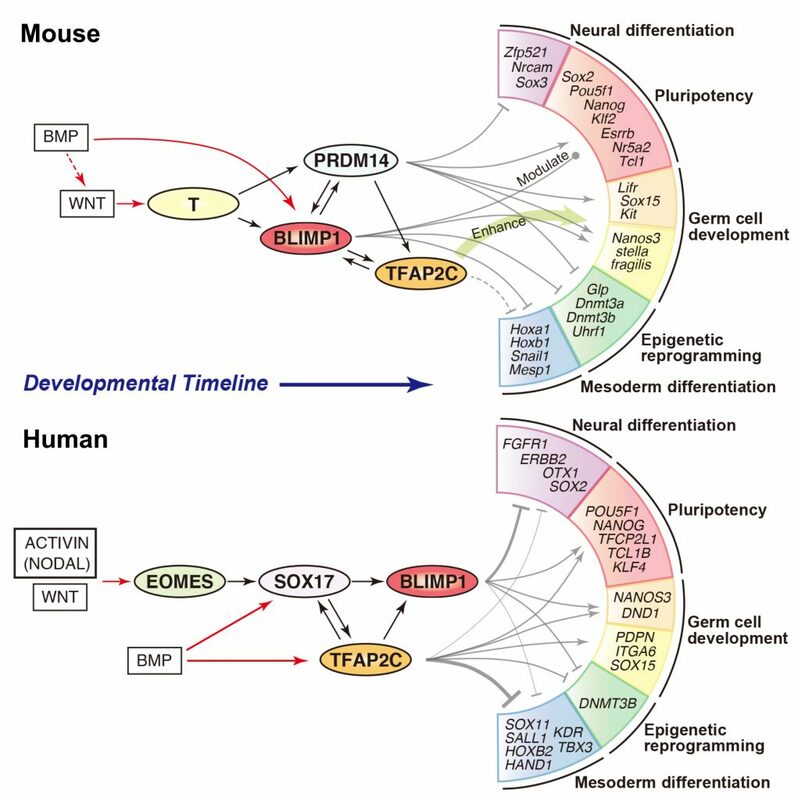 Furthermore, by investigating the development of a non-human primate model, cynomolgus monkeys, we have defined a developmental coordinate of pluripotency among mice, monkeys, and humans, and shown that the germ cell lineage in primates is specified in the nascent amnion, providing a pivotal insight into the biological relevance of the hPGCLC induction pathway. More recently, we have succeeded in differentiating hPGCLCs into human oogonia that undergo a proper epigenetic reprogramming and acquire an immediately precursory state for meiotic entry. We hope that these lines of research will lead to a better understanding of the mechanism for the transmission/diversification of genetic information, for the regulation of epigenetic information, and for the acquisition of totipotency, among mice, monkeys, and humans. Figure 1. A model for the signaling and transcription architectures for mouse (top) and human (bottom) germ cell specification (Kojima et al., Cell Stem Cell, 2017). Figure 2. Ultrastructure of hPGCLC-derived oogonium in xenogeneic reconstitute ovaries (xrOvaries) (Yamashiro et al., Science, 2018). 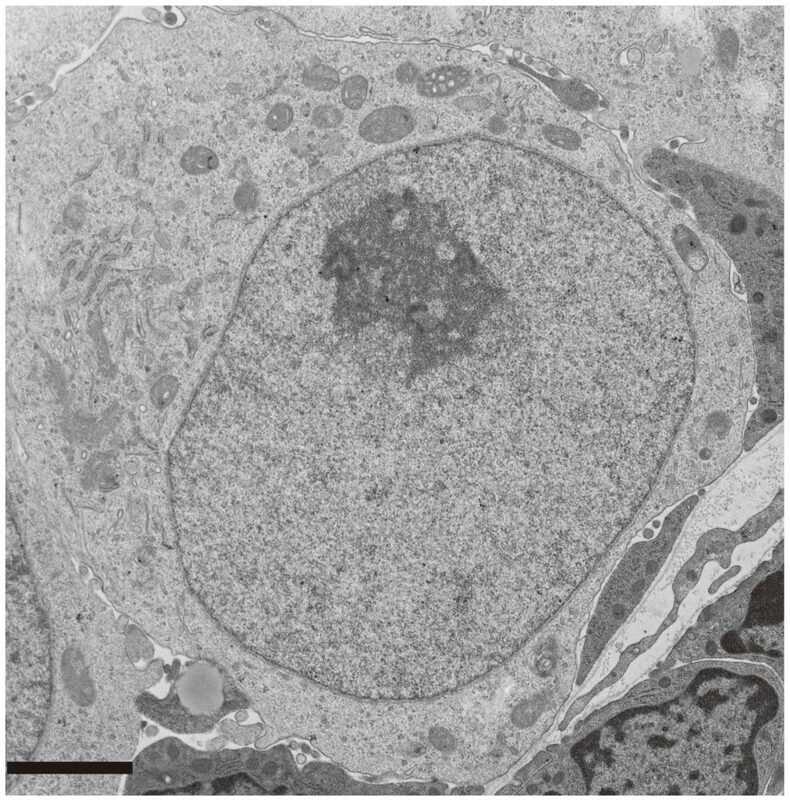 The cell bears a clear cytoplasm with sparsely distributed mitochondria with villiform cristae and an ovoid nucleus with loosely packed chromatin and a prominent granular nucleolus. These properties are highly similar to those of human oogonia/gonocytes. Bar, 2 m. 1.Kurimoto, K., Yabuta, Y., Hayashi, K., Ohta, H., Kiyonari, H., Mitani, T., Moritoki, Y., Kohri, K., Kimura, H., Yamamoto, T., Katou, Y., Shirahige, K., and Saitou, M. (2015). Quantitative dynamics of chromatin remodeling during germ cell specification from mouse embryonic stem cells, Cell Stem Cell, in press. 2.Nakamura, T., Yabuta, Y., Okamoto, I., Aramaki, S., Yokobayashi, S., Kurimoto, K., Sekiguchi, K., Nakagawa, M., Yamamoto, T., and Saitou, M. (2015). SC3-seq: A method for highly parallel and quantitative measurement of single-cell gene expression, Nucleic Acids Research, in press. 3.Aramaki, S., Hayashi, K., Kurimoto, K., Ohta, H., Yabuta, Y., Iwanari, H., Mochizuki, Y., Hamakubo, T., Kato, Y., Shirahige, K., and Saitou, M. (2013). A mesodermal factor, T, specifies mouse germ cell fate by directly activating germline determinants, Developmental Cell, 27, 516-529. 4.Nakaki, F., Hayashi, K., Ohta, H., Kurimoto, K., Yabuta, Y., and Saitou, M. (2013). Induction of the mouse germ cell fate by transcription factors in vitro. Nature, 501, 222-226. 5.Yamaji, M., Ueda, J., Hayashi, K., Ohta, H., Yabuta, Y., Kurimoto, K., Nakato, R., Shirahige, K., and Saitou, M. (2013). PRDM14 ensures naïve pluripotency through dual regulation of signaling and epigenetic pathways in mouse embryonic stem cells, Cell Stem Cell, 12, 368-382.